Jackpot Giant is a 3D online progressive jackpot game from Playtech. It was launched in 2014 and has become one of Playtech’s most popular online slots. If features 50 paylines across 5 reels and offers a minimum bet of just 50p a spin. Hidden inside are two bonus features that see giants tossing coins into volcanoes to award you with cash prizes. Five wild features across the payline 1 will award that life-changing jackpot. Jackpot Giant is a friendly smiling giant that uses a Stone Age theme. Enjoy palm trees, blue skies, rocks and potential big wins as you journey through this volcanic game. The focus of the slot machine is to reward players via the erupting volcanoes. You will see two variations of stacked symbols which show the giant himself, situated behind a volcano and trees. These stacked symbols reside on two vertical reel positions and can potentially give lucrative wins, similar to the Golden Goddess slot machine. The bonus symbol is represented by a volcano with the word ‘Bonus’, these can appear on reels 1 and 5. If you can spin these in the base game, you will automatically trigger the ‘Giant Bonus’ feature. Your screen will then reveal six volcanoes and you need to choose three of those. Every volcano hides a cash prize for you to win and two of which also offer ‘Extra Pick’ and ‘Win ‘Em All’ options, giving you more chances to win. When you pick your volcanoes, the friendly giant then tosses coins into the volcano and reveals your prizes. If you can get a 5 of a kind combination, with the wild symbol on payline one, this will trigger the progressive jackpot displayed. To get this jackpot you will need to bet the maximum stake of £4. 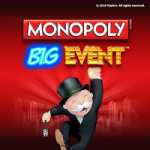 The potential progressive jackpot you can win will be displayed on your screen. Spin in 5 wild symbols anywhere (except on payline one) and you will win 50,000 times your line bet – that’s 1,000 times your stake. 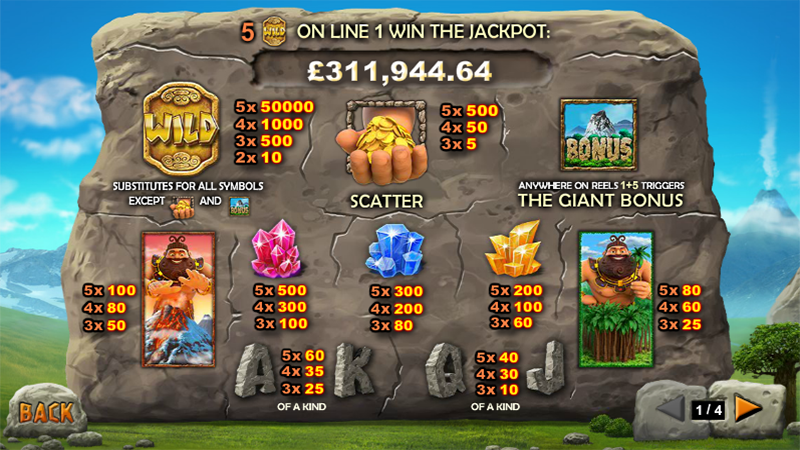 You can play Jackpot Giant on a desktop or a mobile device, the choice is yours. Coin value ranges from 1p up to 8p. All 50 paylines have to be in play every time you spin, plus you can only bet one coin on each fixed payline. This means bets range from 50p to £4 per spin. Some of you may be familiar with Jackpot Giant from Coral and Ladbrokes betting terminals. The online version is very similar, however the progressive pots are far larger, as is the jackpot which has to be capped at £500 on the betting terminals. 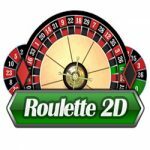 Great animation and good fun to play, with progressive cashpots both online and in the bookies. Cashpots pay within a certain amount of time. Available both online and in the bookies.